Is it the weekend, yet? | Run, Lindsay, Run! Time for an update! Yesterday’s 15 miler was a success! You see, there was a lot of planning going into this run. Since I was running directly to work, on Tuesday I had to bring an outfit and pack a lunch for Wednesday and leave my purse, wallet, etc. at the office overnight since I’d be running to work with only the essentials: keys with gym pass, metrocard, and two office swipe cards. And $2 in case I needed to buy a waterbottle on the way, was unsure of the water fountain situation along the route. Better yet, I had company! I pretty much do all of my runs solo, so this was extremely welcome. Terence met me at my doorstep at 6:30 am and we embarked on our journey around Manhattan..to infinity and beyond! 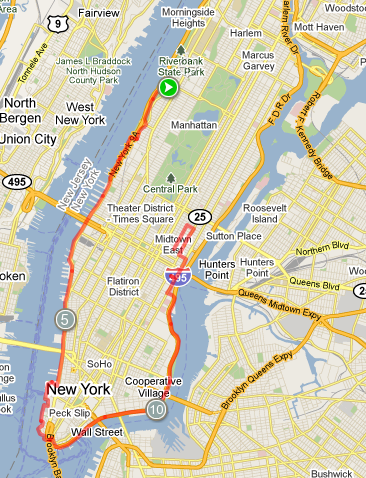 From the Upper West Side, we ran through Riverside Park and down south until it hit the West Side Highway running path. It was hot and humid at the start, but actually seemed to lessen up the further we got into the run. We made our way through Battery Park City, which I hadn’t run through in forever. I used to do morning runs there all the time when I lived downtown, I missed it! When we hit the tip of Manhattan I felt like we were finally hitting the homestretch, despite being only like 8 miles in. Once we got past the bridges and started to head up the East River Path, I really started feeling dehydrated and drained. I have never ever taken any sort of gel, gu, etc. during a training run. I tried a PowerBar Gel at mile 10 in the Half-Marathon for the first time in my life, and that was weird. I only drink water throughout runs when I stop at a fountain. Sure, in college we had Gatorade but only drank that post-workout or long-run, never during. I also have a pretty sensitive stomach while running so I guess I’ve been averse. Plus, who wants to carry a gel or bar thing when running? Not me. But alas, I sucked it up because I know it’s only going to benefit me to try these things in my training runs, because I’ll certainly need them during the marathon! 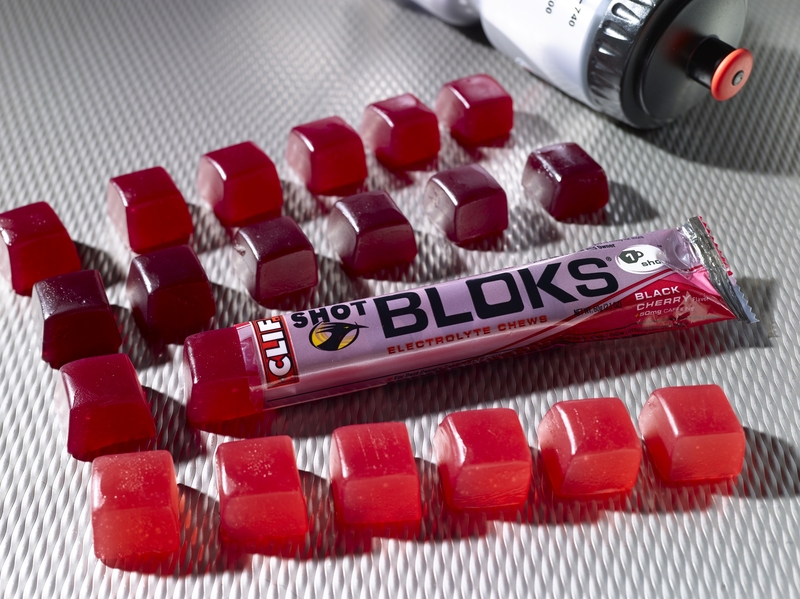 I had stumbled upon Clif Shot Bloks at Target the other week, so I bought a pack to experiment with. However, I didn’t want the entire thing, so I broke off two tiny block pieces and put it in a tiny ziplock and tucked it into the side of my sports bra when I ran. I decided around the 65 minute mark that I would try them. They were big, and kinda hard to chew while running. But reminded me of a big fruit snack/gummy bear, and it tasted great! I had the black cherry flavor. I don’t know if it REALLY helped much, as I still felt like crap the last 3 miles, but it certainly didn’t hurt either. Will have to keep trying new things…gels and gus might be easier for me to consume while running. He left me a little after 12 miles around 23rd st and I continued my solitary journey on the East River path. But it ends about 10 blocks up, so then it felt like a game of adding on another 20 minutes…stop and go every few blocks around the UN, dodging suits who stare at you frightened because you’re running towards them dripping in sweat, fun times. I had to go a bit further past my office on 45th to add on some time, but I did it! Just about 15 miles (okay, maybe like ¼ mile short, but I’m saying 15) A NEW longest run EVER! And in the office by 9:05! PHEW. This morning, I headed out for an easy run. Figured I’d shake out my legs, and expected them to be extremely heavy and lactic. Surprisingly, not at all! A little soreness here and there, but not that dead, lethargic feeling. Hooray! I did 7 miles, instead of my planned 6. Tonight my college roommate, Emily, is coming into town from Denver! We’re getting dinner once she lands, and her and her boyfriend are staying over my place. I’m excited to see her, she hadn’t been here since earlier this summer. We’ll have plenty of time to hang out this weekend while we’re both down at the JERSEY SHOREEEE. And then again when I go out to CO to visit her in early October. Well, I think this post is sufficiently lengthy. Congrats to anyone that made it this far. I should really work on condensing my writing…but really don’t care that much.